The IHRA heads to Memphis International Raceway this weekend (Oct. 18-20) for the IHRA World Finals where they will crown world champions in Top ET, Mod ET, and Junior Dragster. 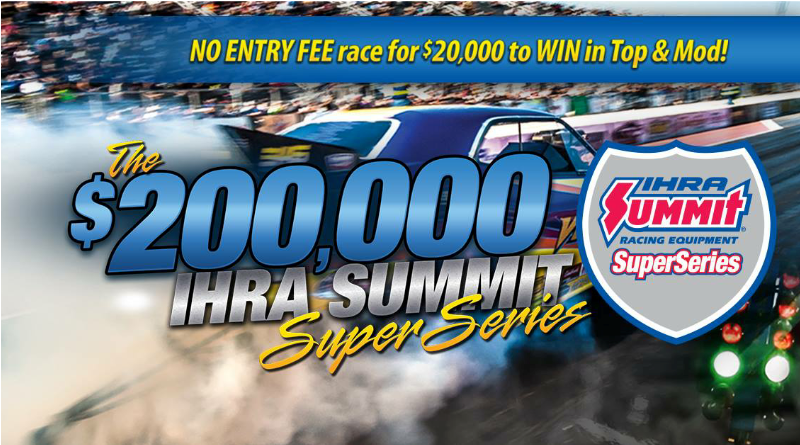 The World Finals is the final event in the $200,000 IHRA Summit SuperSeries program. If you missed out on this years World Finals, make sure you review the information below so you can participate in 2019. FREE ENTRY FOR $20,000 TO WIN IN TOP AND MOD! * Join the IHRA Summit SuperSeries for Top, Mod or Juniors which includes IHRA membership benefits, Summit SuperSeries license, then request a Summit SuperSeries number (also called the X Number). * Sign up for the track points at your participating IHRA Summit SuperSeries track. * Race at your local IHRA track while running your Summit SuperSeries X number. Your Summit SuperSeries eligibility does not begin until you register with IHRA and run the X number as your car number. Your X number must show up on your home track points page all year long. Failure to run the X number on your car or failure of your number appearing on your home tracks point page will make you ineligible for the Summit SuperSeries even if you have a registered X number on file with IHRA. Failure to maintain a current membership will result in a deduction in points for the events your membership was expired. “Gifted Rounds” are not permitted. Racers receiving ‘dives’ or ‘gifted’ rounds as determined solely by IHRA will be disqualified. DragChamp has all the latest IHRA bracket racing news and results. Visit DragChamp daily for all your bracket race results.